The National Institutes of Health (NIH) have identified Practice Based Research Networks (PBRN) as fundamentally necessary to support the translation of research into clinical practice. The PBRN is the clinical laboratory for collecting important patient-oriented data in athletic training. PBRNs enhance the ability to engage clinicians in the research process, provide clinicians with answers to clinically relevant questions, implement quality improvement strategies, and translate research findings back into clinical practice. We have created a diverse PBRN of athletic trainers in secondary schools, colleges, and clinics to engage in injury surveillance and clinical outcomes research to determine the effectiveness of athletic training services, characterize athletic training practice, and evaluate the economic impact of athletic training services. The Athletic Training PBRN has the potential to revolutionize clinical research and evidence-based practice within the athletic training profession. (S.580: Healthcare Research and Quality Act of 1999). PBRNs are characterized by an organizational framework that transcends a single site or study. The mission of the Athletic Training PBRN is to improve the quality of care and patient outcomes in patients under the care of certified athletic trainers. The PBRN is administered through A.T. Still University and consists of partnerships with Professional (a.k.a., entry-level) and Post-Professional Athletic Training Education Programs as well as hospital groups and clinics, establishing a geographically diverse group of clinical sites. Faculty from academic centers, hospitals or clinic groups serve as regional coordinators for clusters of clinical practice sites. Each cluster consists of an average of five clinical practice sites where ATs are providing patient care services to athletes and active individuals. The PBRN was developed to meet the AHRQ guidelines for the basic PBRN infrastructure elements. 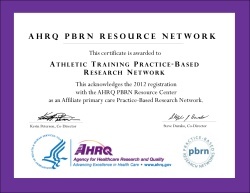 In April, 2010, we achieved affiliate PBRN status from the AHRQ which is granted to practice based research networks that meet specific criteria, but are made up of less than 50% primary care physicians. The Athletic Training PBRN is one of only three affiliate PBRNs in the United States. Currently, our PBRN consists of an initial group of secondary school ATs who have been provided with the required technology infrastructure using funds from previous grants and are actively engaged in data acquisition. The PBRN literature is unambiguous regarding the benefits of partnering local academic centers with community-based clinicians. The athletic training practice based research network will take advantage of local academic centers to develop a nationally representative and geographically diverse group of clinical practice sites (CPS). The PBRN Director, Dr. Tamara Valovich McLeod oversees the PBRN personnel, infrastructure, and research scientists. Included within the personnel, are several expert research scientists who are dedicated to the development, collection, and analyses of specific research questions. 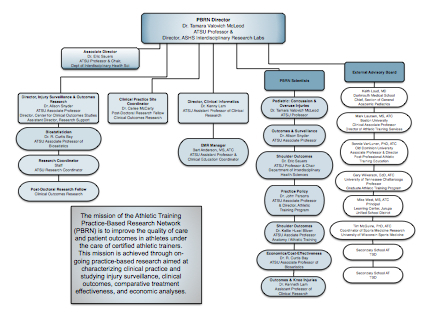 The primary focus of the PBRN is the study of the athletic training outcomes and epidemiology of sport-related injury. These investigations are under the scientific direction of Dr. Alison Snyder, our resident expert in outcomes and epidemiology. Studies focusing on specific injuries or body areas are led by the research scientist with expertise in that area. Concussion studies are directed by Dr. Tamara Valovich McLeod, while shoulder and overhead athlete studies are directed by Drs. Eric Sauers and Kellie Bliven. Furthermore, we have research scientists in our PBRN with expertise in the healthcare management aspects of EMR utilization, practice characterization, and economic analyses in Drs. Parsons and Bay. Collaborating scientists who oversee clusters of clinical practice sites are eligible to participate in research within the PBRN. The PBRN is designed to grow over time by recruiting more academic clusters linked to multiple CPS. The benefits of this PBRN model are numerous and include strengthened local academic and community partnerships for engagement in clinically relevant research.